After watching just a couple of cooking shows I realized that I was cooking all wrong. It seems like all the pros use “EVOO” or extra virgin olive oil when they cook-up their meals. Not only is EVOO considered the “healthier” cooking oil, but it’s also high in anti-oxidants and monounsaturated fatty acids (which may reduce your risk of heart disease.) If you’re not familiar with how to cook with EVOO, you can download the new Let’s Cook! 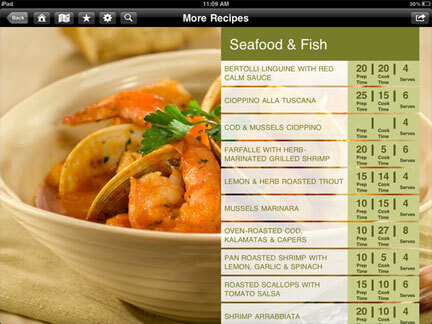 iPhone/iPad App to get cooking tips from Top Chef contestant Fabio Viviani. Ever wanted to cook alongside a Top Chef Fan Favorite? 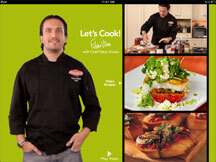 Fabio Viviani from Top Chef All Stars and Season 5 Fan Favorite has just launched an iPhone and iPad app — Let’s Cook! — now available on the App Store. I’ve been trying my hand at cooking for awhile now, but I’ll be honest when I say I haven’t really ventured into serious meat cooking. After a horrible “lemon chicken” debacle a couple of years ago, cooking meats has pretty much been heating up a sausage or cooking a burger. I decided to be adventurous and try the totally delicious sounding Skirt Steak with Polenta recipe. Unfortunately, my plans were thwarted almost from the start when I discovered my grocery store doesn’t carry polenta, but I decided to swap it out with garlic Parmesan risotto, which came conveniently in a box. Plans back on track. 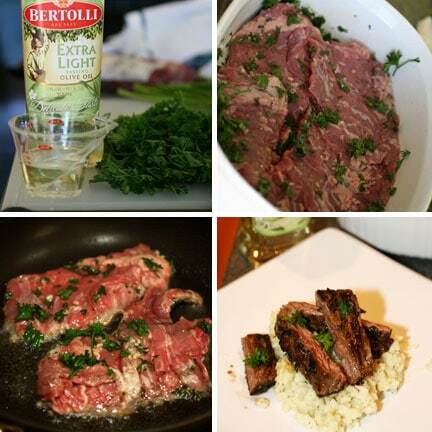 I chopped up the parsley and garlic, then mixed it with Bertolli Extra Light Tasting Olive Oil to create the marinade for the steak. I had never marinated with olive oil before, so I wasn’t sure how the results would turn out. After marinating, I cooked up the steak, filling the house with a wonderful aroma of herbs and meat. I’m happy to say that I did not overcook the steak and successfully served a delicious meal. 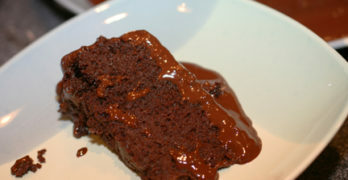 You can find many other recipes on the Let’s Cook! app, broken down by category, and conveniently showing you prep time, cooking time, and the number of people the recipe serves. If you want to start cooking like a Top Chef, you can download Let’s Cook! from the iStore for just $0.99. Two winners will receive two (2) 8.5 oz bottles of Bertolli Olive Oil! For me, it’s the flavor of Olive Oil that I like so I choose it for cooking. I love cooking with Olive Oil because it’s healthy and tastes delicious! I love how wonderful your food tastes when you cook w/olive oil and it’s better for you! I love olive oil it’s tasty, healthy, and makes it easy to make a great dish. My favorite is pasta, olive oil, onion, garlic, veggies, and red pepper–easy and delicious. I love love brushing olive oil onto pita bread and sprinkling basil over it. Bake for a few minutes and you have the most delicious pita chips! besides being healthy, it adds a nice flavor to what you are cooking. I LOVE olive oil and love this brand..I cook with it because the flavor is great and it has good healthy benefits. I love cooking my meats with olive oil. Especially when i make a pasta salad i cook my meat with olive oil and it taste sooo good and i know im eating something healthy and yummy. I like cooking with olive oil for the taste and because it’s healthier. It is healthy for you. I like the taste of olive oil better. It’s also healthier than other unnatural oils like vegetable oil and canola. I ove cooking with olive oil because it has great flavor and lots of monounsaturated fats! I really love the flavor of olive oil and it’s heart healthy! Thanks for this opportunity! It is a healthier and tastier way to cook! I love cooking with olive oil because it is healthier and tastes better! Thanks so much for the fantastic giveaway! I LOVE THE TASTE, I USE IT ON MY RED POTATOES AND I BAKE THEM WITH SPICES SOOO GOOD. I enjoy cooking with olive oil, ’cause it reduces my chances for heart disease. That and it tastes good when combined with fresh garlic. I like using olive oil because it’s light and a healthier alternative. Olive oil is the healthiest alternative that can withstand high heats. It is so much healthier than other oils. I like cooking with olive oil because it is healthier than many of the other oils. I’ve always cooked with olive oil and love the flavor and health benefits. It’s so much better for you than other oils, plus we love the taste. I cook everything with olive oil instead of vegetable oil. Olive oil is healthy and I like the flavor. I like cooking with olive oil because it doesn’t make my food feel as “heavy” as other oils. Cooking with olive oil brings so much more flavor to food. i like cooking with olive oil because it is the healthy choice for my family. I like the taste and because I know it’s better for us than other oils. I like cooking with Olive Oil because it tastes great and is heart healthy. I like cooking with olive oil because it is healthy and taste good. I love to saute veggies in olive oil. Oh it is soooo good. It’s so versatile. Cooking & dipping. I like cooking with olive oil because it’s clean and it tastes great. I cook with olive oil for the deep base flavor it provides. I honestly just love the taste of olive oil! I like it because it’s healthier. Olive Oil is delicious! It is not only good for frying, but as a component in recipes and a dip for bread. I love cooking with it because it is healthy. I love making caprese salad with some garlic olive oil. YUM! Olive oil is a must for Seafood over Pasta! I use Olive oil for salads too. We cook heavily with olive oil because we believe in its benefits! I love cooking with olive oil because it healthier for me and I just love to unique taste it brings to my recipes. I grew up with it and really enjoy the flavor. taste gr8 and good for you! I like using olive oil for roasting vegetables in the oven. the flavor is much better. Because the food is tastier and healthier. I like cooking with olive oil because it’s a healthy choice and it has a nice taste. Olive Oil is a lot healthier to cook with plus it reminds me of the trip I took to Italy. It gives a great flavor on my pastas and pizzas. I love the taste of olive oil in cooked items and drizzled and dipped items. I don’t cook with olive oil, but would like to try. I love the flavor, plus it’s healthy! Olive Oil is more flavorful than veggie oil. Because it is healthy and has more flavor! It is healthier for you. It’s healthier and easy to use/cook with. I love cooking with olive oil because it’s healthier and taste good. olive oil is heart healthy! Because it raises your good cholesterol! Its healthier and makes food taste good. Because it is better for you than almost all of the other types of cooking oil. I like to cook with olive oil because it is healthier and adds a great flavor. Olive oil enhances the flavors the herbs and spices that you are cooking with and it tastes so good. Bertolli is my favorite-extra light organic! I like that it gives my food flavor and doesn’t weigh it down in calories! To be more healthy and it tastes better. 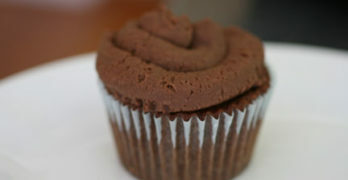 It is better for you and taste great. I like that it’s healthy! It gives the food so much flavor. I like cooking with olive oil because it’s so heart healthy. Because olive oil is very good for your heart. Love to make home made pizza with it. I like eating healthy and olive oil tastes good!! It tastes alot better & it’s healthier than other oils. Thanks! I love using olive oil because it keeps my spaghetti looking good! It’s healthy and it tastes good! Olive oil imparts a nice depth you don’t get with other oils. Try it for old school popcorn! 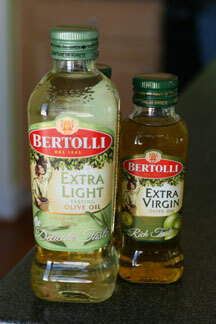 We always cook w/Bertolli’s olive oil it’s good for you and the food tastes so good not greasy!!! It’s a healthy oil to cook with! I like cooking with olive oil because the flavor is better and it’s healthier. I have started using olive oil so much more than other oils because it’s so much better for you. I could really use these. along with being healthier for you it makes u feel good to know your doing good for your family and personal health. I love the flavor and healthiness of it. Because it has a lighter taste. The overall taste is so much better than any other oils and its health benefits are awesome! I grew up with Italian cooking and nothing beats the smell of garlic cooking in olive oil. Because it makes everything taste wonderfuL! I like cooking with olive oil because it is healthier than other oils. I have high cholesterol and olive oil is better for you. I love cooking with it because of the taste. Thanks for the giveaway…we cook with olive oil because it is a healthy alternative to other types of vegetable oil. I like cooking with olive oil because I like the flavor it adds.